In days of yore, men of distinction liked to keep a country pad to escape from the smells and noise of the metropolis where they went about their daily affairs. Think William Hogarth, JMW Turner, Horace Walpole, the Rothschilds. And there were many more. Of course, these are now no longer in the country, but rather in modern suburbia. Being a denizen of West London, I’m in the happy position that many of these buildings are in very convenient reach. 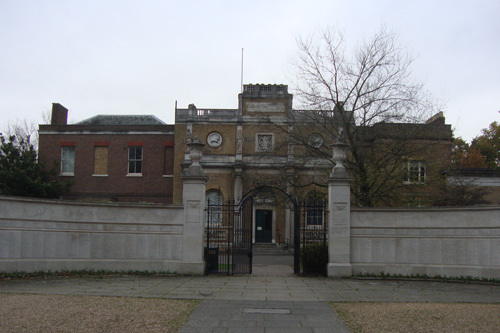 Last weekend we visited Pitzhanger Manor in Ealing. 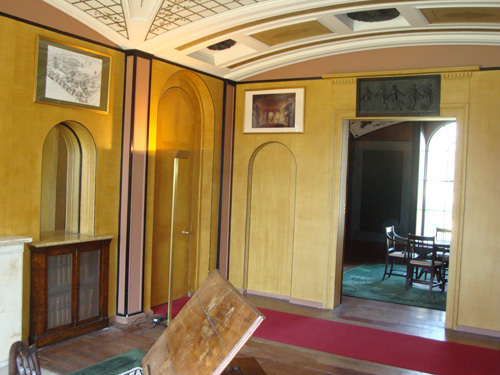 It once belonged to the celebrated architect Sir John Soane (1753 – 1837), who designed and built most of it. 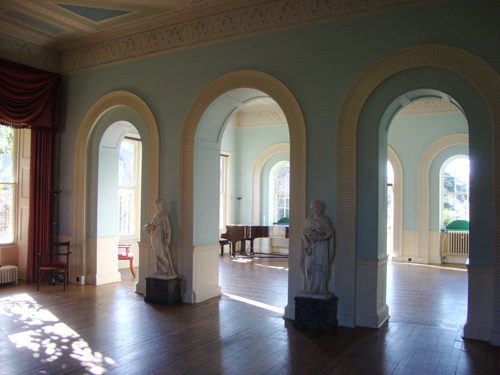 Apart from servants’ quarters to the immediate north and an ancient folly which have both disappeared, the complex today it is still pretty much how Soane left it. 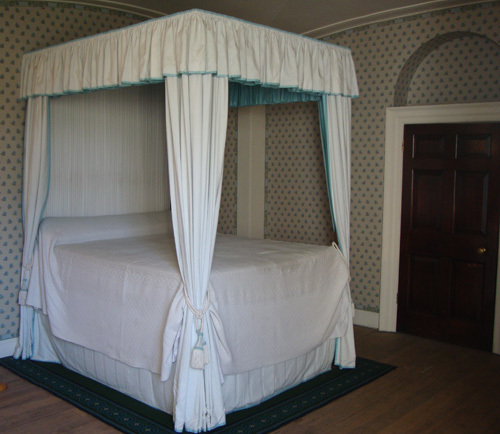 When Soane first bought the house in 1800, it was the version he co-designed with his former boss, George Dance the Younger (1741 – 1825). He demolished most of it, leaving just what is now the South wing, it is said in deference to Dance. That’s the bit on the left with the boarded up window in the picture below. 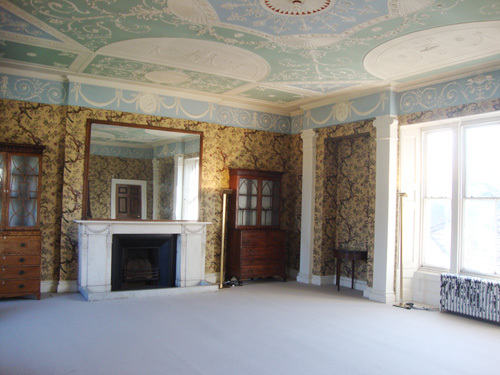 By 1804, the new house was complete, but Soane only kept it for another six years before selling it on in 1810. The architect frequently preferred to walk there from his town house in Lincoln’s Inn Fields which must be a good eight miles. Imagine that. View of the rear of the house from the garden. 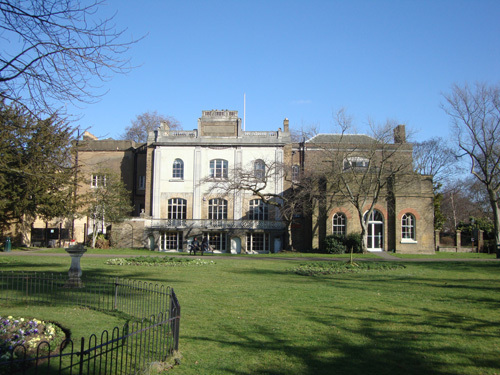 Pitshanger Manor, Ealing, as described above. Entrance: free. Sir John Soane’s Museum in Lincoln’s Inn Fields (London’s largest square). The museum is housed in Soane’s town house, which he used for architectural experiments and to house his eclectic and wacky collection of paintings, sculptures and antiquities (including Hogarth’s Rake’s Progress series – worth the visit alone). He bequeathed the lot to the nation. Entrance free. While you’re in the neighbourhood, try and find time to visit the Hunterian Museum across the square. Entrance also free. Dulwich Picture Gallery. 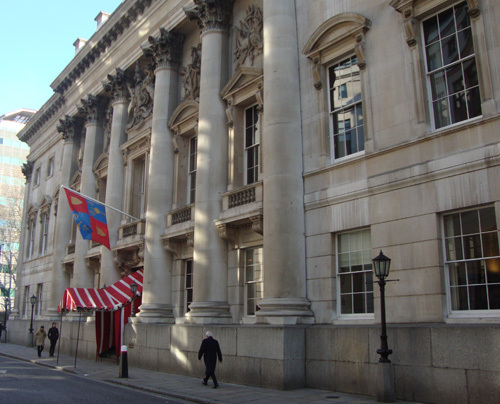 Founded in 1811, and designed by Soane. A gorgeous art collection. Entrance £5. St Pancras Old Church. The Soane family tomb in the church yard was designed by the architect himself. The dome was famously copied by Giles Gilbert Scott in the 20C for the roofs of London’s red public phone boxes. Entrance: Free. 27 February marks the birthday of one Edward Cave (1691 – 1754), one of my favourite characters of the Georgian scene. Cave is not a household name in the annals of London history and nor was he a born Londoner, hailing as he did from Warwickshire. 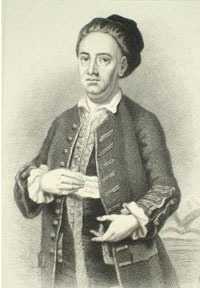 But in 1731 he founded the Gentleman’s Magazine and was responsible for sharing Samuel Johnson’s talents with a broad readership when Johnson was trying desperately to build his career in London as a writer, having failed dismally and deludedly in trying to succeed as a teacher. Cave was ahead of his time. 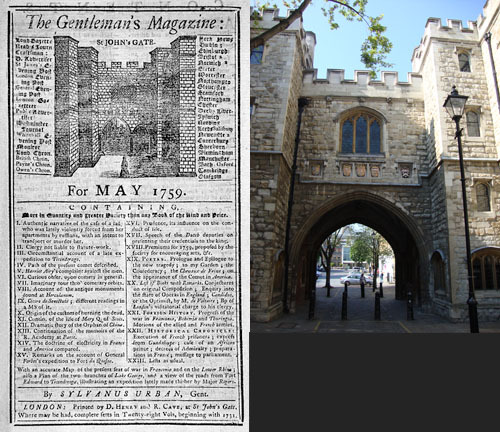 He launched Gentleman’s Magazine into the crowded periodical market in 1731 as a general interest monthly with broad content and bigger than its rivals which tended to be more frequent and usually thinner. His was the first to employ the word “magazine” to describe a publication. A magazine back then was understood to denote a large repository, as in the military sense. In the early days, much of the content was borrowed, and usually reworked, a bit like The Week is today. This invited harsh criticism – mainly from jealous rivals – which led to Cave employing writers such as Johnson, who worked for the magazine for several years from 1741. Imitation being the sincerest form of flattery, barely a year after Gentleman’s Magazine, a rival was launched, called the London Magazine. Strapline: or Gentleman’s Monthly Intelligencer. Shameless! The Gentleman’s Magazine’s early success was built on reader engagement and in particular Cave reached out to the burgeoning provincial middle classes, making it a truly national publication. He encouraged poetry and published submissions from readers by way of competitions. He also gave much coverage to science and new discoveries, including a paper by Benjamin Franklin. Parliamentary reporting being banned at this time, thinly disguised sketches from the “senate of Magna Lilliputia” were published, mostly by Johnson when he was at the magazine. 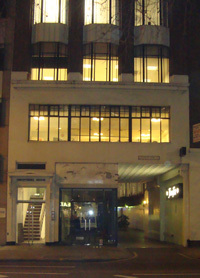 Cave’s HQ was in St John’s Gate, Clerkenwell, from where he published. Most of the time Johnson worked on site, largely to ensure that he met his deadlines under his proprietor’s watchful eye. The polymath worked behind a screen, supposedly because his tics and eating habits were said to be offputting for colleagues. Poor Johnson. An illustration of St John’s Gate was the masthead logo of the magazine which survived long after Cave and Johnson’s time, until 1922. It’s only rival in this respect is The Spectator (est. 1711), thankfully still with us. You can still visit St John’s Gate today, which is part of the St John’s Museum, and you can actually see the room in which these writers worked. Interestingly, some decades earlier, William Hogarth’s father ran a coffee house at the site, where punters were only permitted to speak Latin. It was not a success. Gentleman’s Magazine from 1859. Edward Cave’s pen-name was Sylvanus Urban; and St John’s Gate today. Edward Cave’s HQ. Interior of St John’s Gate. Edward Cave lived a varied and full life. Physically well-built, he was a headstrong character, being expelled from Rugby school as a boy and encountering some difficulty completing his apprenticeship having fallen out with the widow of his master. He cut his teeth as a publisher at the Norwich Post while still indentured, no doubt setting him in good stead for his later career as a media baron. In addition to the Gentleman’s Magazine, Cave published several hundred other pamphlets and books, quite a few by Johnson. While doing all this, he also worked for the Post Office between 1721 and 1745, first as a sorter and then as an inspector of franks. He used (or abused) this position to farm news stories. In the 1740s he bought a cotton mill in Northampton, investing in the very latest spinning technology. Cave was generally not well liked, characterised as being bombastic and mean. Unsurprisingly, Johnson thought otherwise, writing a generous biography. 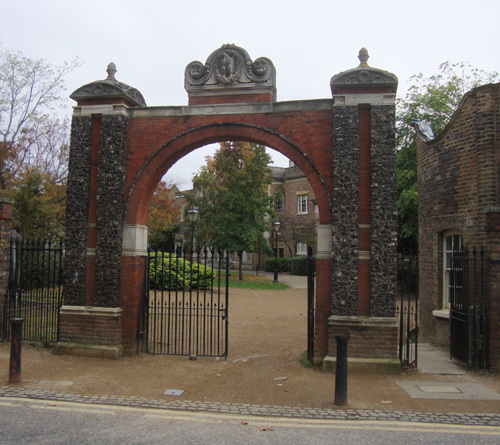 In his later years, he suffered terribly from gout and died at St John’s Gate on 10 January 1754. He was buried at St James’s, Clerkenwell. Source: DNB is good, but you need a subscription. 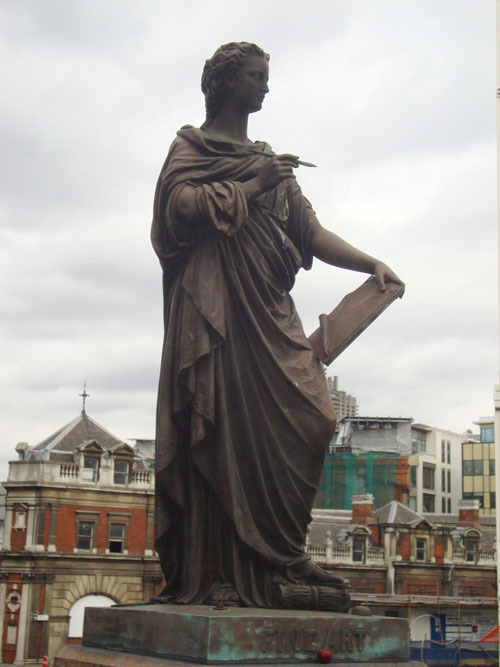 London’s first flyover, opened by Queen Victoria in 1869, Holborn Viaduct spanned the new Farringdon Road. It was just one of many Victorian civil engineering projects which utterly transformed London’s streetscape. Painted in confident maroon and gold, it was richly decorated. Here are some of its enhancements, which I shot last week. 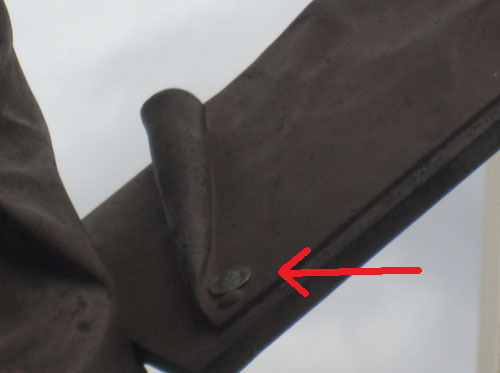 There are four statues on the viaduct’s parapets: Agriculture, Commerce, Science and Fine Art. 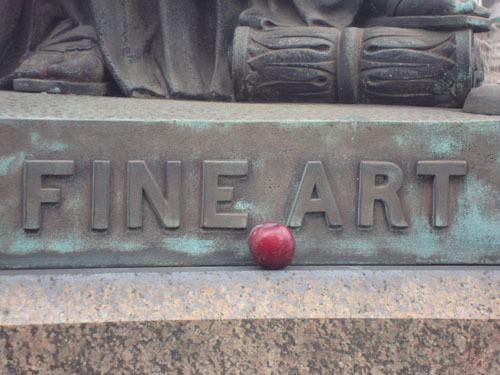 I was intrigued that someone had placed a fresh plum on the pediment of Fine Art and a 50p piece on her painting. One can’t get within six feet of the parapet due to four foot concrete barriers. So person or persons unknown will have gone to some trouble. Is there some sort of tradition here, or was it simply an eccentric act? 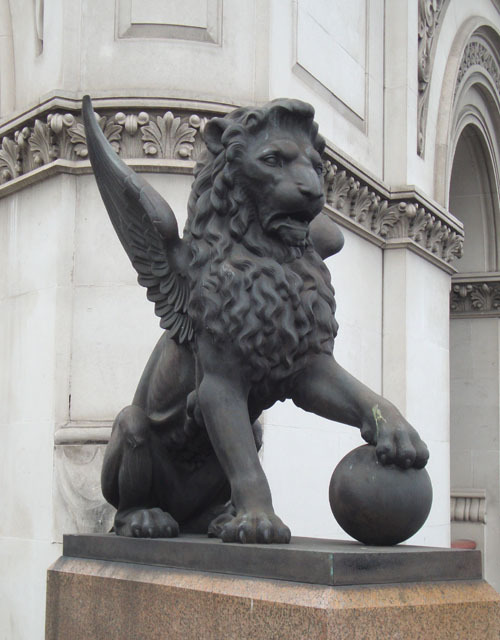 At either end of the viaduct we have winged lions. 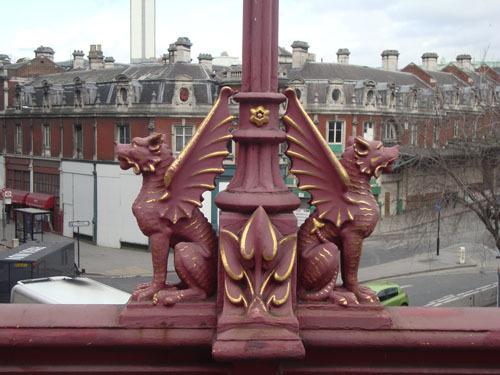 Elsewhere along its length are highly decorative lamp posts and fine griffins. 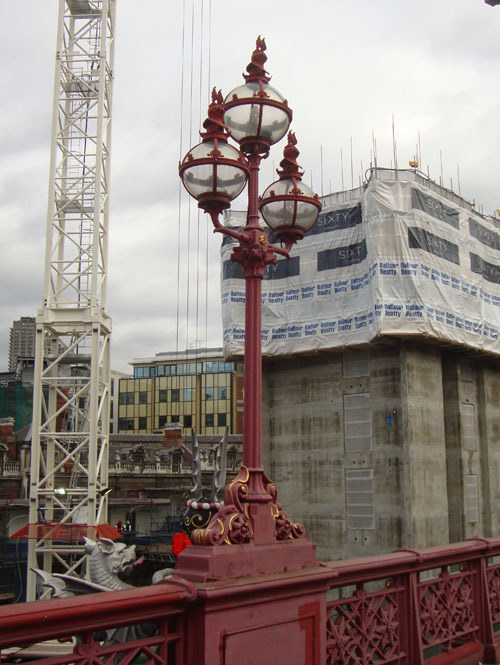 Incidentally, friend and member of London Historians, the historic paints expert Patrick Baty, recently completed his analysis of Holborn Viaduct. Presumably the decorators will be in soon. This is a lovely little book, literally. Although hardback and lacking a dustjacket, it is covered in crimson cloth with smart, white embossed lettering, used sparingly. 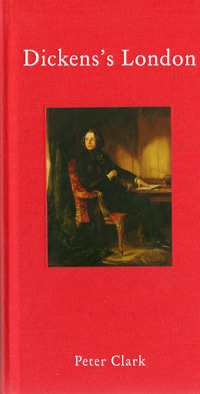 Set in the centre is a glossy image of a very young Dickens. The inside front and back covers are decorated with 19th Century Ordnance Survey mappage from Putney in the West to Greenwich in the East. The book is four inches by eight inches, perfect for the coat or jacket pocket. This is important, because Dickens’s London is essentially a guidebook, with five Dickens-related walks in Central London, minutely described. But that’s not all. The book has an impressive Introduction and – after the descriptions of the walks – a chapter on London suburbs and how they relate to Dickens and his life and works: Camden Town, Chelsea, Greenwich, Hampstead, Highgate and Limehouse. Dickens’s London tells us all about the houses, factories, inns, streets, churches and offices that existed in the novelist’s lifetime and what exists in these places today. Sometimes they relate directly to Dickens’s life, but mostly they reference in scholarly detail the part played by these sites in the novels, how they affected and were populated by the dramatis personae of the books: there is hardly a character from the canon who doesn’t get a mention. The author quotes the relevant passages by Dickens, which are set in bold type. It is worth mentioning here that the content pages of the book, like the cover, are very nicely laid: simply designed and set (in Garamond, for those interested in typography). It is clear that author Peter Clark is no Dickens bandwagon-jumper. His knowledge of the works and how they relate to London geography is immense. But he wears his scholarship lightly, making the book both a joyful and easy read. It can be used as a reference work in its own right or – as intended – a book one can use on one’s own Dickens voyage of discovery. And it really doesn’t matter if, like me, you are a bit of a Dickens dunce: it makes you want to learn more about the great man. So for aficianados and L-plate drivers alike, I warmly recommend Dickens’s London as a fabulous companion guide. Dickens’s London (130 pp) is published on 16 February by The Armchair Traveller at bookHaus, cover price £9.99, although available at around £7.00. 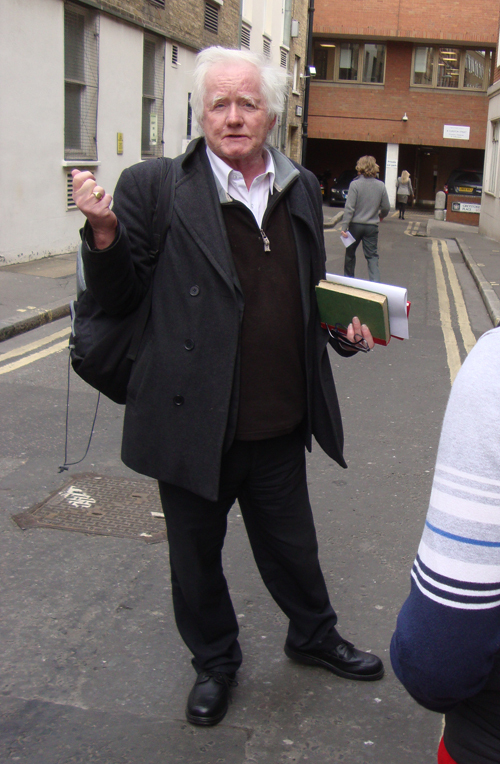 Author Peter Clark is conducting a free guided walk on 21 February at 2pm, starting at Lincoln’s Inn. The above-mentioned guided walk is done, and it was delightful. There were about 20 of us, great turn-out. Peter showed us around Lincoln’s Inn and Inner and Middle Temple. All the legal stuff, so plenty of Bleak House references. His guiding style, like his prose, is relaxed, accessible and engaging. Afterwards, we went to Ye Olde Cheshire Cheese in Fleet Street for a bit of a social. 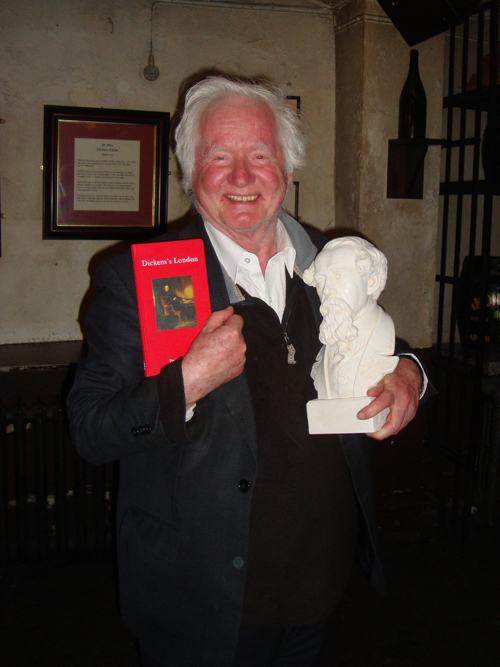 Peter’s publisher presented him with a handsome bust of Charles Dickens. It was a pleasure getting to know the author. Turns out among other things Peter is an Arabic translator and an expert on Byzantium and the Near East, in particular Syria, where he lived for five years in the 1990s. Hidden treasure. Behind these buildings in Queen’s Yard (entrance on right) lurks the Government Art Collection. Thanks to a tip-off by Jo Moncrieff of Westminster Walking, I got myself a slot on last Wednesday’s visit to the Government Art Collection (GAC). It was arranged under the auspices of the Whitechapel Gallery‘s current series of exhibitions featuring art from the collections. 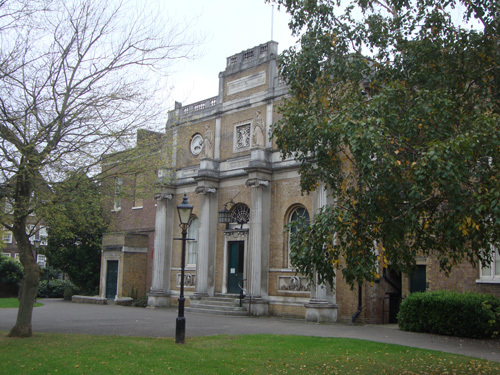 The Government Art Collection is based in Queen’s Yard just of Tottenham Court Road, near Goodge Street Station. You wouldn’t notice it from the street, and indeed it has traditionally kept a low profile over the 113 years of its existence. It all began in 1898 when the government decided to catalogue and unify all the art it owned. It has come under various departments over the years, currently the Department for Culture, Media and Sport. From the early days, the government decided it needed to have a programme of acquisitions, providing GAC with a whole £300 and a few years later a further less-than-generous £250. A very partial list of artists in the collection includes: Thomas Lawrence, Francis Bacon, Thomas Gainsborough, Joshua Reynolds, John Constable, William Hogarth, JMW Turner, Paula Rego, Peter Lely, Lucien Freud, David Hockney, Paul Nash, Stanley Spencer, Augustus John and yes, Tracey Emin. Search the full list here. The collection comprises about 13,000 objects, mainly paintings, drawings, engravings and the like, but also antiques such as silverware. Most of these are distributed among government departments throughout the land, but importantly also our embassies and consulates abroad. At present, about a third of the stock is held at HQ. And this is what we came to see. About 25 of us were shown around by Clive Marks, the collection’s Senior Administrator and curator Roger Golding. These two gentlemen really know their stuff and they clearly relished showing us around despite it being outside of their working hours. The GAC is broadly three areas: two rooms are for display; a further room is the archive, where all the “inactive” works are stored; and finally a large room is used for checking objects in and out, and importantly where works are repaired, conserved and prepared for despatch to their new homes. The staff of the GAC play an important curatorial role in the advice they give to ministers and civil servants about the most appropriate pieces for government walls, and where advice is not sought, make the actual selections themselves. In addition to checking out what was on the walls, our hosts selected some pieces that may interest us. I don’t know how they knew I was coming, but on the conservator’s table was a series of four colour engravings which featured panoramic views of Central London across the Thames by Samuel and Nathaniel Buck dated 1749, one of which featured the brand new Westminster Bridge. Such treasure. I drooled. But there was another, done forty years later by Sayer which was an update of the Buck image, but had worked in the new Blackfriars Bridge. Here they both are. View of Westminster by Samuel and Nathaniel Buck, 1749. © Crown copyright: UK Government Art Collection. View of Westminster, Buck, updated by Robert Sayer to include Blackfriars Bridge, 1788. © Crown copyright: UK Government Art Collection. Seeing the Government Art Collection. Between now and September Whitechapel Gallery are showing selections featuring choices by Simon Schama, Downing Street staff and new commissions. Entrance is free. If you’re really patient and a member of London Historians, we’re visiting on 26 June 2013! My thanks to Robert Jones for permission to use the above images. 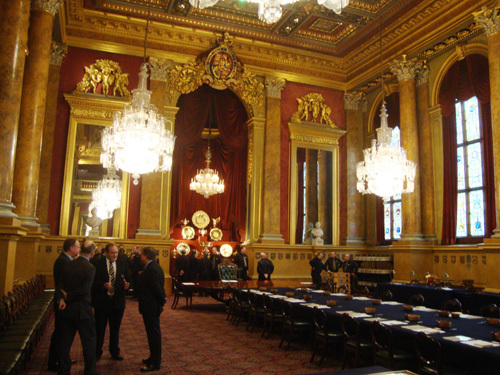 Today was the opening ceremony of the annual Trial of the Pyx, held at Goldsmiths’ Hall. The trial lasts until May and about a hundred members of the public are allowed to spectate on the opening day. I managed to secure a small stash of tickets for London Historians, my thanks to the Company of Goldsmiths for that. Goldsmiths' Hall. 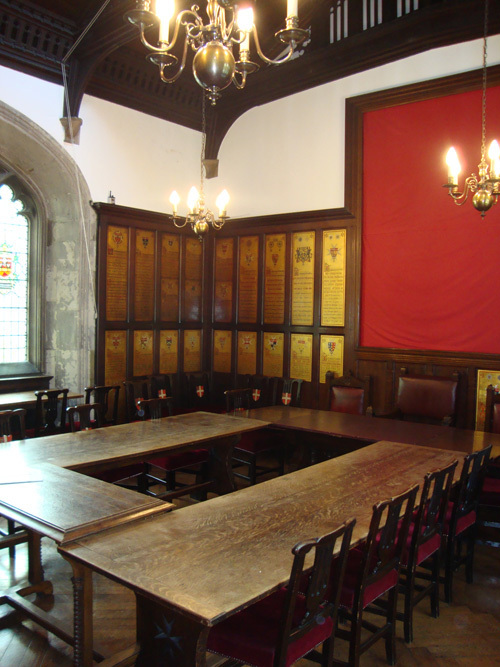 One of the lucky livery halls which survived the Blitz. By Philip Hardwick, 1835, who also designed the Euston Arch. Goldsmiths' Hall, interior. Before the ceremony, the jury table, with the Remembrancer's chair at the far end. The Trial of the Pyx is an ancient ceremony dating from the 1240s in which the integrity of the coins of the realm is examined and tested for size, weight, quality and composition. The number of jurors varies, but is usually between twelve and fifteen. So too does the number of coins examined, but in recent years around 188,000. The ceremony is opened and closed by the Queen’s Remembrancer, the oldest judicial position in the land. He wears typical judge attire, except that on top of his wig is perched a small black tricorn hat. This can be disconcerting, because at first glance it appears not unlike when the death sentence is passed. But it is always satisfying to see ancient ritual and regalia being observed. Take note, Mr Speaker! Once the Remembrancer arrives, each member of the jury stands up and announces his or her name. The entire jury then holds a copy of the Gospels and are sworn in to the affect that they promise to do a good job. The Remembrancer then gives his opening address. This year it was on the topic of the historical problem of the clipping of coins in an age when they still comprised precious metal; and how the authorities tried and failed to eliminate the practice. Very interesting it was too. The Rembrancer then departed to leave the jury and officials of the Goldsmiths’ Company to get on with the job of sifting and examining coins. It’s an arcane and complicated process, which I’ll leave for another time. Intrepid London Historians, after the ceremony. 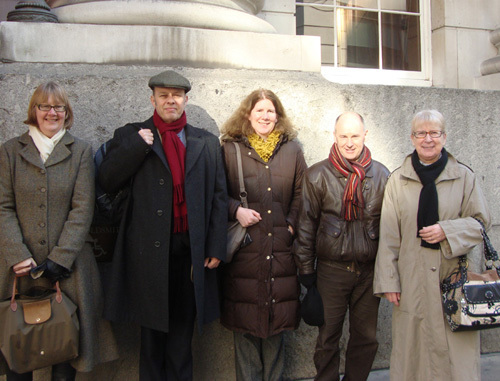 An article by Mike Rendell on London Historians web site. Scroll down a bit. 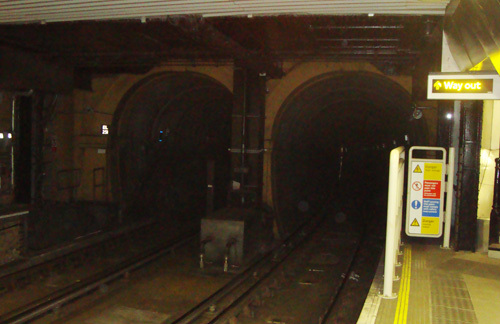 The other day I caught the East London Line train from Canada Water to Wapping, travelling through – I think for the first time – Marc Brunel’s tunnel under the Thames. Taking 17 years to complete, between 1825 and 1842, it was his crowning achievement, only made possible by the tunnelling shield, his own invention. The device hosted a team of miners digging and removing spoil while workers behind them lined the tunnel with a sleeve made from bricks or iron hoop lining. Construction commenced on the Rotherhithe bank in the south, eventually linking to Wapping on the opposite bank. Like most of these affairs, the project was dogged by financial and practical difficulties. In 1834 the government had to bail out the Thames Tunnel Company to the tune of £246,000. The tunnellers lived with danger every day, from flooding, from poisonous flammable gas, and seepage of pre-Bazalgette sewage-infested Thames water. Many lost their lives, almost including Brunel’s more celebrated son, Isambard. Unquestionably, the work adversely affected the health of both men. Originally conceived as a road tunnel, the passage never served that purpose, eventually becoming a rail link for the East London Railway in the 1860s, a function it serves to this day. Marc Brunel's twin bore tunnel today at Wapping Station. Marc Isambard Brunel (1769 – 1849) lived a life of extraordinary highs and lows. He was born of Normandy farming stock, trained as a cabinet maker, then as a young man, went to sea. As a Royalist in post-Revolutionary France, Brunel was forced to emigrate to the USA, but not before having met an English girl, Sophia Kingdom, who years later became his wife. 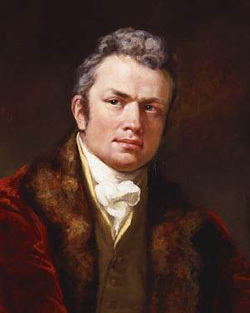 The self-made engineer spent most of the 1790s making a name for himself on large-scale projects such as canal construction, eventually becoming chief engineer of New York City. The opportunistic Brunel then invented a method of mass-producing wooden pulley blocks for the Royal Navy, settled in London and married Sophia, who had in the meantime returned to England. Collaborating with some of the leading engineers of the day, the ambitious engineer undertook many projects, many for the army and navy throughout the wars against his homeland. But during the years after Waterloo he overstretched himself on the business side and ended up in debtor’s prison in 1821. The resourceful Brunel saw an escape route by offering his services to the Tsar of Russia. Only then did the government swing into action, led by the Duke of Wellington, deciding to pay £5,000 to release the man who’d been so instrumental, in his way, of defeating Napoleon. Marc and Sophie had three children, the youngest of whom – Isambard Kingdom Brunel – became our most famous engineer. Prompted by Prince Albert, Brunel senior was knighted by Queen Victoria in 1841. He was elected to the Royal Society in 1814. 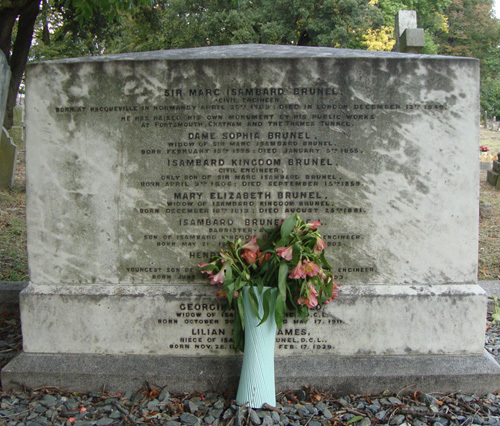 Marc Brunel died in 1849 after a number of strokes and was buried in Kensal Green Cemetery. Marc Isambard Brunel has been overshadowed in history by his remarkable son. But everything IK Brunel achieved was done on the shoulders of his father, a man who carved his engineering career from scratch not just through his genius and energy, but with huge dollops of self-belief, vision, ambition and chutzpah. As a city and a nation, we owe a debt to this remarkable Frenchman.